The CTLA-4 (CD152) molecule is up-regulated upon T cell activation and proliferation, and plays a critical role in the inhibition of immune responses. We show in this study that cAMP induces up-regulation of CD152 in human CD4+ T lymphocytes. This effect occurs in the absence of the up-regulation of CD69 and CD25 activation markers and T cell proliferation. In addition, we found that the Ca2+ ionophore ionomycin also up-regulates CD152, and that the combination of a cAMP analog or cAMP inducers with ionomycin further enhances the expression of CD152 in resting CD4+ T lymphocytes. However, cyclosporin A, which inhibits Ca2+/calcineurin signaling pathway, fully prevented the ionomycin- but not the cAMP-induced up-regulation of CD152. The effects of cAMP and ionomycin involve increase of both CD152 mRNA transcripts, coding for the membrane and the soluble forms of CD152. Furthermore, we show that CD152 molecules are translocated to the membrane and are functional, as their engagement by specific mAbs prevented NF-κB activation by anti-CD3/CD28 stimulation. These findings demonstrate that at least two novel signal pathways regulate CTLA-4 gene expression and CD152 molecule up-regulation in human CD4+ T lymphocytes, in the absence of full T cell activation. CD152 is expressed on T lymphocytes and plays an important role in the down-modulation of immune responses (1, 2). CD152 is a structural homologue of CD28 and shares with it the ligands CD80 (B7.1) and CD86 (B7.2). However, engagement of CD28 or CD152 delivers opposing signals to T cells; while CD28 promotes IL-2 production and T cell proliferation, CD152 engagement results in impaired IL-2 production and T cell unresponsiveness (3). Furthermore, while CD28 is constitutively expressed on the surface of resting T cells, CD152 is mainly expressed in intracellular recycling vesicles, and it is transported to the cell surface upon T cell activation (4). CD152 is involved in the regulation of autoimmunity and T cell tolerance. Indeed, the blockade of CD152 in vivo exacerbates autoimmune responses in murine models of multiple sclerosis and insulin-dependent diabetes mellitus (2) and results also in the breakdown of T cell anergy (5). Following TCR/CD3-mediated signaling, the transcription of CTLA4 gene increases and is further enhanced by either CD28-mediated costimulation or IL-2 (6, 7). However, the signaling pathways leading to CD152 up-regulation in T cells are not completely defined. The role of cAMP as a second messenger in cells of the immune system has been widely described (8). In particular, elevation of intracellular cAMP in T lymphocytes has an inhibitory effect on proliferation and IL-2 production (9), and has been shown to affect early T cell activation events (10). In this study, we have investigated whether there is any relationship between the increase of intracellular cAMP and CD152 expression in human CD4+ T lymphocytes. cAMP binds to and activates protein kinase A (PKA),2 which in turn phosphorylates downstream effector proteins such as Csk or transcription factors that bind to a cAMP-responsive element in the DNA, named CREB (11). However, alternative pathways of cAMP action independent from PKA have been described (12). It is known that cAMP is able to open cation channels permeable to Ca2+, and the level of Ca2+ in turn can regulate cAMP levels by activating or inhibiting either adenylyl cyclases or phosphodiesterases (13). However, the molecular interplay between Ca2+ and cAMP signaling in T lymphocytes is not completely defined. In this study, we show that cAMP induces CD152 expression on resting CD4+ T lymphocytes and that the combination of cAMP and the Ca2+ ionophore ionomycin (Ion) further enhances the expression of CD152 in these cells. RPMI 1640 supplemented with 2 mM l-glutamine, 1% nonessential amino acids, 1% pyruvate, 100 U/ml penicillin, 100 μg/ml streptomycin (Life Technologies, Grand Island, NY), and 10% FCS (HyClone Laboratories, Logan, UT) was used as complete medium in all cultures. Anti-CD3 (clone UCHT1) and anti-CD28 (clone CD28.2) mAbs were purchased from Immunotech (Westbrook, ME) and BD PharMingen (San Diego, CA), respectively. Cholera toxin (CT) and CT B subunit (CT-B) were purchased from Calbiochem-Novabiochem (San Diego, CA); forskolin (FSK), dibutyryl cAMP (dbcAMP), Ion, and cyclosporin A (CsA) were purchased from Sigma-Aldrich (St. Louis, MO). PBMC were isolated from healthy donors by Ficoll-Hypaque (Pharmacia, Uppsala, Sweden) density centrifugation. CD4+ T lymphocytes were purified by negative selection using an immunomagnetic cell sorting (Miltenyi Biotec, Bergisch Gladbach, Germany). Briefly, PBMC were labeled using a cocktail of hapten-conjugated mAbs anti-CD8, CD11b, CD16, CD19, CD36, and CD56 molecules and MACS MicroBeads coupled to an anti-hapten mAb. The magnetically labeled cells were depleted by retaining them on a column using MidiMACS cell separator. PBMC or CD4+ purified T cells (2 × 106/ml) were treated either with CT (3 μg/ml), CT-B (3 μg/ml), dbcAMP (from 0.01 to 0.5 mM), FSK (50 μM), or Ion (200 ng/ml), and analyzed at different time points. PBMC were also stimulated with anti-CD3 mAb (1 μg/ml). In some experiments, CsA (1 μg/ml) was used as inhibitor of Ca2+/calcineurin signal pathway. FITC- or PE-conjugated anti-CD4, CD152, CD25, and CD69 mAbs and their isotype-matched controls were purchased from BD PharMingen (San Diego, CA) and used for direct immunofluorescence staining. CD152 detection was performed by intracellular staining. Briefly, cells were washed twice in PBS, 1% BSA, and 0.1% sodium azide and stained with anti-CD4 mAb on the membrane for 15 min at 4°C. Samples were then fixed in 4% paraformaldehyde for 5 min at 4°C; incubated with anti-CD152 mAb; and diluted in PBS, 1% BSA, and 0.5% saponin. The cells were finally washed twice in PBS, 1% BSA, and 0.1% saponin, and acquired on a FACSCalibur instrument running CellQuest software. Total RNA was extracted using RNAFast reagent (Life Technologies), according to the manufacturer’s recommendations. The single-stranded cDNA was synthesized using 1 μg of RNA by reverse transcription using random examers (Invitrogen, San Diego, CA). PCR were performed with cDNA corresponding to 10 ng of RNA, Taq polymerase (Invitrogen), and primers designed to amplify the entire coding sequence of CD152: 5′-ATGGCTTGCCTTGGATTTCAGCGGCACAAGG-3′ and 5′-TCAATTGATGGGAATAAAATAAGGCTGAAATTGC-3′. PCR was as follows: 94°C for 5 min, 30 cycles 94°C for 30 s, 58°C for 30 s, and 72°C for 30 s, followed by a final extension at 72°C for 7 min. The amplified fragments were separated on 1% agarose gel and visualized by ethidium bromide. 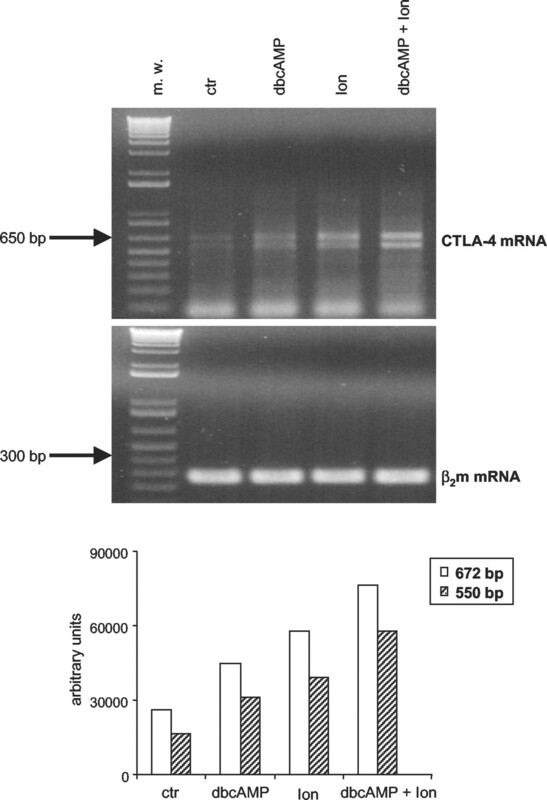 RNA integrity and cDNA synthesis were verified by amplifying β2-microglobulin cDNA. The intensity of the revealed bands was directly quantified by Image QuaNT software (Amersham Pharmacia Biotech, Piscataway, NJ), which gives rise to a volume report (expressed as arbitrary units, a.u.) by integrating the area of the bands and their OD. CD152 mRNA values were normalized to those of β2-microglobulin and expressed as a.u. Binding reactions containing 12 μg cell extracts, 10 mM Tris-HCl, pH 7.6, 150 mM NaCl, 1 mM DTT, 1 mM PMSF, 0.5 mM EDTA, 10% glycerol, 0.5 mg poly(dI-dC), and 1 μg BSA were incubated for 30 min with 5000 cpm of 32P-end-labeled double-stranded oligonucleotide in a total volume of 10 ml. The probe was 5′-AGTTGAGGGGACTTTCCCAGGC-3′. Labeling of the probe was obtained by incubating 10 pmol of oligonucleotide with 10 pmol [γ-32P]ATP and 10 U T4 polynucleotide kinase for 30 min at 37°C. The probe was then purified with Micro BIO-Spin P-30 columns. Complexes were separated on 6% polyacrylamide gel. After drying, gels were exposed on phosphor screen and were then analyzed by phospho/fluorescence imager STORM 840 (Amersham Pharmacia Biotech). The intensity of the revealed bands was directly quantified by Image QuaNT software (Amersham Pharmacia Biotech). 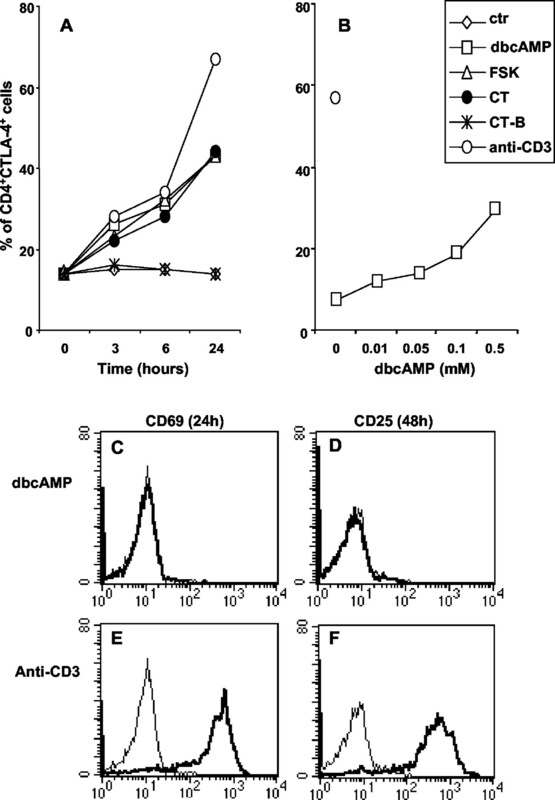 To investigate whether intracellular increase of cAMP had any effects on the expression of CD152, we treated human PBMC with an analog of cAMP, dbcAMP, or with agents that increase intracellular cAMP and analyzed CD152 expression in CD4+ T lymphocytes by intracellular staining (Fig. 1⇓). An increase in the percentage of CD4+CD152+ cells was evident already after 3 h of incubation with dbcAMP and, after 24 h, 45% of the CD4+ T cells were CD152+ (Fig. 1⇓A). The up-regulation of CD152 by dbcAMP was dose dependent, as shown in Fig. 1⇓B. The increase of CD152 expression was also observed with FSK, which directly activates adenylyl cyclase, and with CT, a bacterial toxin that causes intracellular cAMP increase by ADP ribosylation of Gs proteins (Fig. 1⇓A). In contrast, treatment with CT-B, the B subunit of CT, which lacks the ADP-ribosyl transferase activity, did not affect the up-regulation of CD152. Finally, anti-CD3 mAb-activated cells, which were included in the experiments as a positive control, showed a high CD152 up-regulation, as expected (Fig. 1⇓, A and B). Up-regulation of CD152 induced by cAMP in the absence of T cell activation. A, CD152 expression at different time points after incubation of PBMC in the presence of medium alone (ctr), dbcAMP, FSK, CT, CT-B, or anti-CD3 mAb. The cells were stained with anti-CD4 mAb on the membrane, fixed, permeabilized, and stained with anti-CD152 at time zero and after 3, 6, and 24 h of culture. B, Dose-response curve of CD152 up-regulation with dbcAMP after 24 h of culture. The control of CD152 up-regulation by anti-CD3 mAb is also shown. C–F, PBMC incubated with dbcAMP (C, D) and with anti-CD3 mAb (E, F) were double stained with anti-CD4 and anti-CD69 mAbs after 24 h of culture or with anti-CD4 and anti-CD25 mAbs after 48 h. Cytofluorometric analysis was performed on CD4+-gated population. The data shown are from one representative experiment of three performed. To rule out the possibility that dbcAMP, FSK, and CT up-regulate CD152 molecule by inducing activation of T cells, we analyzed the expression of the activation markers CD69 and CD25, after 24 and 48 h, respectively, of culture. Fig. 1⇑ (C–F) shows that the treatment with dbcAMP did not alter the expression of the early activation marker CD69, nor that of CD25, whereas activation of the cells with anti-CD3 mAb induced up-regulation of CD69 and CD25 molecules, as expected. Furthermore, while anti-CD3-activated cells proliferated, those treated with dbcAMP remained in a resting state (data not shown). Similar results were obtained with the cAMP inducers FSK and CT (data not shown). To evaluate whether cAMP-dependent up-regulation of CD152 correlated with an increase of mRNA, we analyzed the CD152 mRNA in PBMC cultured in the presence of dbcAMP (Fig. 2⇓). We observed an increase of two mRNA transcripts that correspond to the membrane (672-bp) and the soluble (550-bp) molecule of CD152 (14). Altogether, these results show that the increase of intracellular cAMP leads to increased CD152 mRNA and protein levels in T lymphocytes, and that this occurs in the absence of full T cell activation. CD152 mRNA expression in T lymphocytes. CD152 mRNA was evaluated in human PBMC either unstimulated (ctr) or stimulated with dbcAMP, Ion, or both. RNA integrity and cDNA synthesis were verified by amplifying β2-microglobulin cDNA. The graph represents CD152 mRNA quantification of the two mRNA transcripts, both normalized to those of β2-microglobulin. To investigate whether the effect of cAMP on CD152 expression was affected by increased Ca2+ levels in T cells, purified CD4+ T lymphocytes were treated with Ion in the presence or absence of dbcAMP or cAMP inducers. We found that Ion alone up-regulated CD152 to a similar degree as dbcAMP, FSK, or CT (Fig. 3⇓A). However, a stronger induction of CD152 was observed by concomitant treatment of the cells with Ion and either dbcAMP, FSK, or CT, with >70% of the CD4+ T cells expressing CD152 after 24 h of culture (Fig. 3⇓A). The expression level of CD152 relative to the single cell, expressed as mean fluorescence intensity (MFI), was 14 in the absence of any stimuli and increased to 30–38 with the different stimuli (Fig. 3⇓B). However, an increase of the MFI value to 175–261 was observed after concomitant treatment with Ion and dbcAMP, FSK, or CT (Fig. 3⇓B). These data show that the effects of cAMP and Ca2+ on purified CD4+ T cells are more than additive, suggesting an active integration of the two signaling pathways. At the mRNA level, a stronger up-regulation of the transcripts corresponding to the membrane and the soluble CD152 molecule was observed with the combination of dbcAMP and Ion as compared with the single treatments (Fig. 2⇑). Finally, the up-regulation of CD152 mediated by Ion alone or by the combination of Ion and the cAMP inducers occurred in the absence of proliferation and expression of the activation markers CD25 and CD69 (data not shown). Ion and cAMP synergize for the induction of CD152 expression. Purified CD4+ T lymphocytes were cultured with Ion, dbcAMP, FSK, or CT, or with Ion in combination with each of the others. Twenty-four hours later, the cells were stained with anti-CD4 mAb on the membrane, and with anti-CD152 mAb after fixation and permeabilization. A, The results are expressed as percentage of CD4+CD152+ T cells. 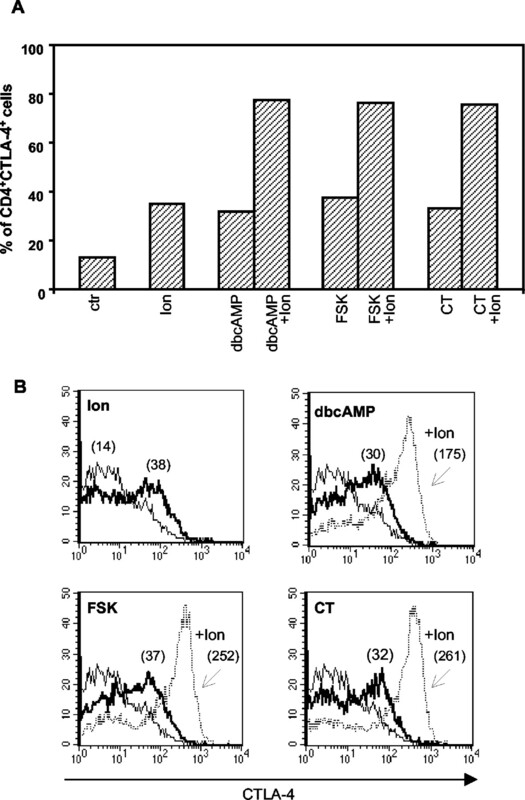 B, The cytofluorometric profiles of CD152 expression are shown for untreated CD4+ T cells (thin line), cells cultured either with Ion, dbcAMP, FSK, or CT alone (bold line), or with the combination of Ion and dbcAMP, FSK, or CT (dotted line). Numbers in parentheses indicate MFI values. The data shown are from one representative experiment of four performed. It has been described that cAMP can influence Ca2+ levels in different cell types, and that many adenylyl cyclase isoforms are Ca2+ dependent. In the attempt to understand the relationship between Ca2+ and cAMP signaling pathways in the up-regulation of CD152, purified CD4+ T cells were treated with CsA, which is known to interfere with the Ca2+/calcineurin signaling pathway. CsA fully prevented the Ion-induced up-regulation of CD152 (Fig. 4⇓A), confirming that Ca2+-mediated signals are involved in CD152 up-regulation. However, CsA did not affect the induction of CD152 mediated by dbcAMP or FSK (Fig. 4⇓B), and only partially prevented the up-regulation of CD152 in the presence of both Ion and dbcAMP or Ion and FSK (Fig. 4⇓C). These data suggest that the up-regulation of CD152 mediated by cAMP is independent from Ca2+ signals, and that at least two signaling pathways may regulate CD152 expression in T lymphocytes. CsA prevents the up-regulation of CD152 mediated by Ion, but not that mediated by cAMP. Purified CD4+ T lymphocytes were cultured with Ion (A), dbcAMP or FSK (B), or with the combination of Ion and dbcAMP or FSK (C), in the presence or absence of CsA. After 24 h, the cells were stained with anti-CD4 and anti-CD152 mAbs, as indicated in the legend of Fig. 3⇑, and the percentage of CD4+CD152+ T cells was analyzed. The data shown are from one representative experiment of three performed. To verify whether CD152 up-regulation induced by cAMP and Ion results in inhibitory effects on T cells, purified CD4+ T cells were cultured with anti-CD3, anti-CD28, and anti-CD152 mAbs in the presence or absence of CT, Ion, or both. Cell extracts were probed with a radiolabeled NF-κB consensus sequence and resolved by EMSA. The data in Fig. 5⇓ show that CT and Ion alone induced NF-κB activation and that their combination resulted in a slightly higher stimulation. Furthermore, the engagement of membrane CD152 by mAbs in CT- or Ion-treated cells inhibited NF-κB activation by 48 and 33%, respectively, and in cells treated with both CT and Ion inhibition of NF-κB activation was 54%. Altogether, these results show that CD152 molecules that have been up-regulated by cAMP and Ion either alone or in combination are expressed on the cell membrane, and that their engagement by anti-CD152 mAb results in inhibitory effects in T lymphocytes. Engagement of membrane CD152 by specific mAb leads to NF-κB inhibition. 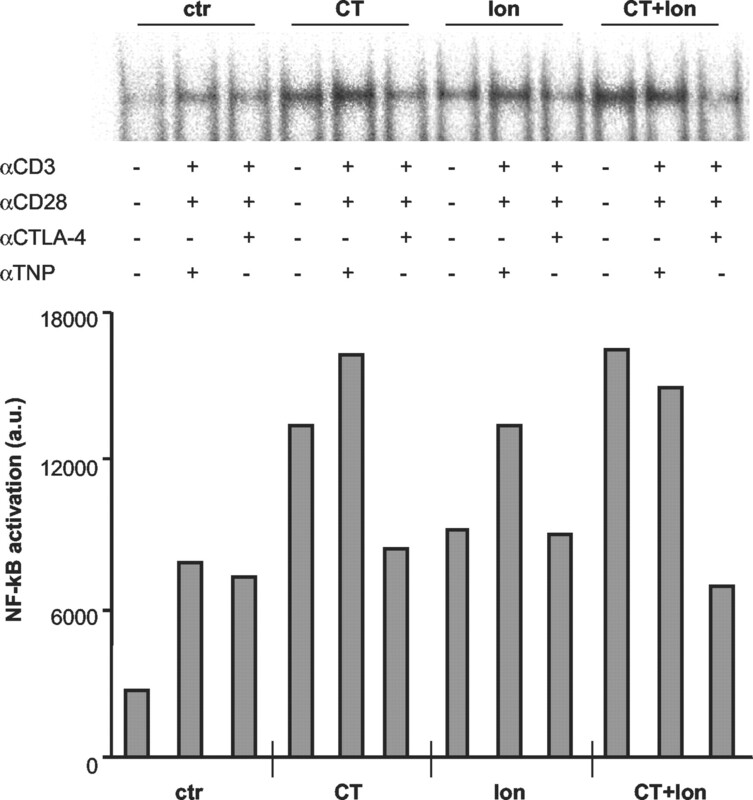 Purified CD4+ T cells were cultured with anti-CD3, anti-CD28, and anti-CD152 mAbs, or with the isotype-matched control anti-trinitrophenol mAb, in the presence or absence of CT, Ion, or both. Cell extracts were probed with radiolabeled NF-κB consensus sequences and resolved by EMSA. The phosphor screen was analyzed by Image QuaNT software, which gives rise to a volume report (expressed as a.u.) by integrating the area of the bands and their OD. The integration of costimulatory and inhibitory signals is a critical aspect of lymphocyte function. CD152 is the best studied inhibitory receptor on T lymphocytes. It is normally up-regulated upon T cell activation and is involved in the termination of immune responses. In this study, we observed that increased levels of cAMP, mediated either by a cAMP analog or by cAMP inducers, resulted in the up-regulation of CD152 in resting CD4+ T lymphocytes. The regulation of intracellular cAMP levels is critical for many effector functions in T lymphocytes. In general, elevation of cAMP is associated with the inhibition of T cell activation and arrest of cell cycle progression (9). The induction of CD152 expression mediated by cAMP is a new finding consistent with the inhibitory effects of cAMP on T cell activation. Furthermore, the induction of CD152 occurred in the absence of T cell proliferation and activation marker expression. This is in accordance with a previous study showing that cross-linking of CD45RB molecule induced CD152 expression in murine T lymphocytes in the absence of full T cell activation (15). In addition to cAMP, we found that Ion induces up-regulation of CD152 in resting CD4+ T cells, suggesting that a Ca2+-dependent signal transduction pathway is involved in CD152 up-regulation in human T lymphocytes. We also observed a synergistic effect of increased cAMP and Ca2+ levels on the up-regulation of CD152 expression; however, the molecular interplay between cAMP and Ca2+ is not completely defined. cAMP and Ca2+ are important second messengers responsible for the regulation of many cellular events. The stimulation of different membrane receptors by hormones, neurotransmitters, or mitogens leads to increased levels of cytosolic Ca2+ and to the regulation of many physiological functions of T lymphocytes, including proliferation and cytokine production (16). Endogenous molecules such as catecholamines, PGE2, and histamine also modulate intracellular levels of cAMP; however, the rise of intracellular cAMP generally leads to the inhibition of T cell function. The understanding of how the signaling pathways mediated by cAMP and Ca2+ are integrated in the cells has been the objective of many studies. It has been reported that different isoforms of adenylyl cyclase are regulated by intracellular Ca2+ levels (17). In contrast, cAMP is known to regulate Ca2+ levels both directly by opening cation channels and indirectly through PKA (18). In this study, we observed that CsA prevented the up-regulation of CD152 induced by Ion, but not that induced by dbcAMP, CT, or FSK, suggesting that cAMP up-regulates CD152 through a Ca2+-independent pathway. Thus, our results show that two novel signaling pathways regulate CD152 expression. We observed increased CD152 mRNA in cells treated with dbcAMP, Ion, or both. Two mRNA variants coding for membrane and soluble CD152 molecules are known to be expressed in resting T lymphocytes; however, the mRNA for the soluble form is found only in nonactivated cells and is inhibited upon T cell activation (14). Interestingly, the up-regulation of human CD152 by cAMP and Ca2+ in resting T lymphocytes involves both isoforms of mRNA transcripts. The increase of CD152 expression by cAMP and Ca2+ could be regulated at the transcriptional level or due to changes in CD152 mRNA stability. CD152 molecules localize primarily to intracellular compartments, and their expression on the T cell surface, at immunological synapses, is proportional to the intensity of the TCR signal (19). In this study, we found that CD152 molecules up-regulated by cAMP in resting T cells localize on the cell surface and mediate functional effects, because anti-CD152 mAbs inhibited the activation of NF-κB. The inhibition of this transcription factor is relevant for the control exerted by CD152 on cytokine production (20). In addition, we found that CT by itself activates NF-κB. This effect may be due to its B subunit, as it has been described for the homologous Escherichia coli heat-labile enterotoxin (21). Increased intracellular cAMP has been implicated in the induction of T cell anergy (22), a state of unresponsiveness, which occurs when T cells are stimulated through CD3/TCR in the absence of costimulation. It has also been reported that CD152 plays an important role in the induction of anergy (23). In this regard, we have previously shown that CD152 ligation by CD80 is required for the induction of unresponsiveness of CD4+ T cells, in a costimulation-deficient Ag presentation system (24). In addition, CD152 has been shown to be involved in the maintenance of peripheral tolerance, because T cell tolerance was abrogated in CD152-deficient TCR transgenic mice (5) and by blocking CD152 engagement in vivo (25). Furthermore, CD4+CD25+ regulatory T cells, which display an anergic phenotype and exert immunosuppressive functions, constitutively express CD152 (26, 27), although further studies are needed to elucidate the role of CD152 in these cells. A physiological role of cAMP- and Ca2+-induced up-regulation of CD152 on T cells could be the modulation of the inflammatory reaction. Indeed, metabolites that act through cAMP pathways, such as adenosine, are released in inflamed tissues (28). We are currently investigating the function of T lymphocytes treated with cAMP. In conclusion, we demonstrated that CD152 expression is up-regulated by cAMP and Ca2+ influx in resting T lymphocytes. This suggests that CD152, which is normally involved in the termination of immune responses, may also play an important role in preventing T cell activation. The up-regulation of mRNA for the soluble CD152 form suggests that the inhibitory effects may be further amplified. Thus, substances that increase intracellular cAMP could be a tool for the generation of resting CD4+CD152+ T cells that may be useful for therapeutic purposes, such as the treatment of autoimmune and inflammatory diseases or the prevention of transplanted organ rejection. We thank Dr. R. Lindstedt and Dr. N. Rogers for helpful discussions, and Dr. A. Carattoli for her advice and for the reagents provided. ↵2 Abbreviations used in this paper: PKA, protein kinase A; a.u., arbitrary unit; CsA, cyclosporin A; CT, cholera toxin; CT-B, CT B subunit; dbcAMP, dibutyryl cAMP; FSK, forskolin; Ion, ionomycin; MFI, mean fluorescence intensity.